This collection includes publications, reports, public records, and various documents related to the official business of the Juvenile Welfare Board (JWB) of Pinellas County. The items in this collection are digital copies of the original records maintained by JWB and are provided by the USFSP Digital Archive as a way to promote access to the records of this organization for researchers at USFSP and in the broader community. JWB of Pinellas County maintains the original documents and serves as custodian of record for anyone wishing to inspect documents under the purview of Florida’s Public Records Law. Materials in this collection include annual reports, various publications (including institutional histories), promotional and outreach items, and historical photographs. Cooperman-Bogue KidsFirst Awards for 2013, at a Ceremony Held on 2014 : 03 : 20, Juvenile Welfare Board of Pinellas County. Cooperman-Bogue KidsFirst Awards for 2012, at a Ceremony Held on 2013 : 03 : 21, Juvenile Welfare Board of Pinellas County. Juvenile Welfare Board ASSET Review : 2008 : 11, Juvenile Welfare Board of Pinellas County. Cooperman-Bogue KidsFirst Awards for 2006, at a Ceremony Held on 2007 : 03 : 20, Juvenile Welfare Board of Pinellas County. Cooperman-Bogue KidsFirst Awards for 2004, at a Ceremony Held on 2005 : 03 : 29, Juvenile Welfare Board of Pinellas County. Cooperman-Bogue KidsFirst Awards for 2003, at a Ceremony Held on 2004 : 03 : 30, Juvenile Welfare Board of Pinellas County. Cooperman-Bogue KidsFirst Awards for 2002, at a Ceremony Held on 2003 : 03 : 20, Juvenile Welfare Board of Pinellas County. Cooperman-Bogue KidsFirst Awards for 2001, at a Ceremony Held on 2002 : 04 : 09, Juvenile Welfare Board of Pinellas County. Cooperman-Bogue KidsFirst Awards for 2000, at a Ceremony Held on 2001 : 03 : 22, Juvenile Welfare Board of Pinellas County. Cooperman-Bogue KidsFirst Awards for 1999, at a Ceremony Held on 2000 : 03 : 30, Juvenile Welfare Board of Pinellas County. Cooperman-Bogue KidsFirst Awards for 1998, at a Ceremony Held on 1999 : 03 : 30, Juvenile Welfare Board of Pinellas County. Cooperman-Bogue KidsFirst Awards for 1997, at a Ceremony Held on 1998 : 04 : 02, Juvenile Welfare Board of Pinellas County. Cooperman-Bogue KidsFirst Awards for 1996, at a Ceremony Held on 1997 : 04 : 02, Juvenile Welfare Board of Pinellas County. Drug Use Patterns of Students in Pinellas County by ZIP Code, Juvenile Welfare Board of Pinellas County. ; Pinellas County (Fla.) School Board; and Operation PAR, Inc.
Cooperman-Bogue KidsFirst Awards for 1995, at a Ceremony Held on 1996 : 04 : 02, Juvenile Welfare Board of Pinellas County. Prevelance of Drug Abuse Among Students in Pinellas County : 1996 : 09, Juvenile Welfare Board of Pinellas County. ; Pinellas County (Fla.) School Board; and Operation PAR, Inc.
Cooperman-Bogue KidsFirst Awards for 1994, at a Ceremony Held on 1995 : 03 : 30, Juvenile Welfare Board of Pinellas County. Juvenile Welfare Board Annual Report : 1993 - 1994, Juvenile Welfare Board of Pinellas County. Juvenile Welfare Board Planning Work Group Report : 1992 : 03, Juvenile Welfare Board of Pinellas County. Substance Abuse Prevention for Preschoolers : 1992, Juvenile Welfare Board of Pinellas County. Juvenile Welfare Board Annual Report : 1990 - 1991, Juvenile Welfare Board of Pinellas County. Public Policy Statements of 1985 with annual revisions : 1991 : 07 : 11, Juvenile Welfare Board of Pinellas County. Juvenile Welfare Board Annual Report : 1989 - 1990, Juvenile Welfare Board of Pinellas County. Juvenile Welfare Board Annual Report : 1988 - 1989, Juvenile Welfare Board of Pinellas County. Juvenile Welfare Board Annual Report : 1986 - 1987, Juvenile Welfare Board of Pinellas County. Juvenile Welfare Board Annual Report : 1985 - 1986, Juvenile Welfare Board of Pinellas County. Public Policy Statements of 1985 with annual revisions : 1986 : 07 : 02, Juvenile Welfare Board of Pinellas County. Juvenile Welfare Board Annual Report : 1984 - 1985, Juvenile Welfare Board of Pinellas County. 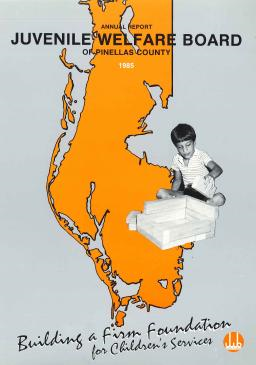 Juvenile Welfare Board Annual Report : 1983 - 1984, Juvenile Welfare Board of Pinellas County. Juvenile Welfare Board Annual Report : 1982 - 1983, Juvenile Welfare Board of Pinellas County. Juvenile Welfare Board Annual Report : 1981 - 1982, Juvenile Welfare Board of Pinellas County. Juvenile Welfare Board Annual Report : 1980 - 1981, Juvenile Welfare Board of Pinellas County. Juvenile Welfare Board Annual Report : 1979 - 1980, Juvenile Welfare Board of Pinellas County. Marriage Counseling Service : 1980s brochure, Juvenile Welfare Board of Pinellas County. Juvenile Welfare Board Annual Report : 1978 - 1979, Juvenile Welfare Board of Pinellas County. Juvenile Welfare Board Annual Report : 1977 - 1978, Juvenile Welfare Board of Pinellas County. Juvenile Welfare Board Annual Report : 1976 - 1977, Juvenile Welfare Board of Pinellas County. Juvenile Welfare Board Annual Report : 1975 - 1976, Juvenile Welfare Board of Pinellas County. Juvenile Welfare Board Annual Report : 1974 - 1975, Juvenile Welfare Board of Pinellas County. Juvenile Welfare Board Annual Report : 1973 - 1974, Juvenile Welfare Board of Pinellas County. Juvenile Welfare Board Annual Report : 1972 - 1973, Juvenile Welfare Board of Pinellas County. Juvenile Welfare Board Annual Report : 1971 - 1972, Juvenile Welfare Board of Pinellas County. Juvenile Welfare Board Annual Report : 1970 - 1971, Juvenile Welfare Board of Pinellas County. Juvenile Welfare Board Annual Report : 1969 - 1970, Juvenile Welfare Board of Pinellas County. Juvenile Welfare Board Annual Report : 1968 - 1969, Juvenile Welfare Board of Pinellas County. Juvenile Welfare Board Annual Report : 1967 - 1968, Juvenile Welfare Board of Pinellas County. Juvenile Welfare Board Annual Report : 1966 - 1967, Juvenile Welfare Board of Pinellas County. Juvenile Welfare Board Annual Report : 1965 - 1966, Juvenile Welfare Board of Pinellas County. Juvenile Welfare Board Annual Report : 1964 - 1965, Juvenile Welfare Board of Pinellas County. Juvenile Welfare Board Annual Report : 1963 - 1964, Juvenile Welfare Board of Pinellas County. Juvenile Welfare Board Annual Report : 1962 - 1963, Juvenile Welfare Board of Pinellas County. Juvenile Welfare Board Annual Report : 1961 - 1962, Juvenile Welfare Board of Pinellas County. Juvenile Welfare Board Annual Report : 1960 - 1961, Juvenile Welfare Board of Pinellas County. Juvenile Welfare Board Annual Report : 1959 - 1960, Juvenile Welfare Board of Pinellas County. Juvenile Welfare Board Annual Report : 1958 - 1959, Juvenile Welfare Board of Pinellas County. Juvenile Welfare Board Annual Report : 1957 - 1958, Juvenile Welfare Board of Pinellas County. Juvenile Welfare Board Annual Report : 1956 - 1957, Juvenile Welfare Board of Pinellas County. Juvenile Welfare Board Annual Report : 1955 - 1956, Juvenile Welfare Board of Pinellas County. Juvenile Welfare Board Annual Report : 1954 - 1955, Juvenile Welfare Board of Pinellas County. Juvenile Welfare Board Annual Report : 1953 - 1954, Juvenile Welfare Board of Pinellas County. Juvenile Welfare Board Annual Report : 1952 - 1953, Juvenile Welfare Board of Pinellas County. Juvenile Welfare Board Annual Report : 1951 - 1952, Juvenile Welfare Board of Pinellas County. Juvenile Welfare Board Annual Report : 1950 - 1951, Juvenile Welfare Board of Pinellas County. Juvenile Welfare Board Annual Report : 1949 - 1950, Juvenile Welfare Board of Pinellas County. Juvenile Welfare Board Annual Report : 1948 - 1949, Juvenile Welfare Board of Pinellas County. Juvenile Welfare Board Annual Report : 1947 - 1948, Juvenile Welfare Board of Pinellas County. Enabling Ballot Language : 1946 : 11 : 05 : Referendum, Juvenile Welfare Board of Pinellas County.